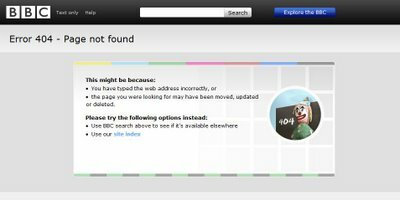 Does the BBC now have the best 404 page? I’m not sure when the change was made, but both 404s are currently available on the site. For those who were not fortunate enough to be brought up with the BBC’s iconic clown in the 60s,70s and 80s, it was featured on the BBC’s test card (..and according to wikipedia still makes occasional appearances). This is a 404 that is guaranteed to make people smile and feel less miserable about not finding the page they expected; every 404 is a trip down memory lane. 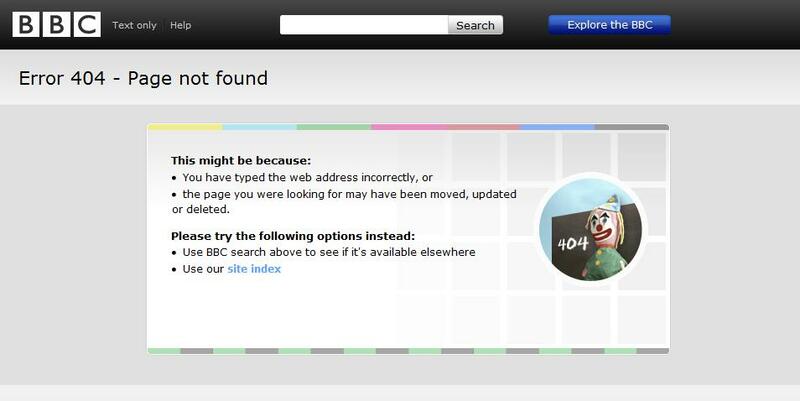 It’s such an obvious choice of a 404 when you think about it, it’s surprising that it took the BBC so long use it. It would be nice if more sites made efforts on their 404s, as it’s amazing how many of them we come across as we surf around the web. Nb. Personally I hate redirects, I’d rather know the page I was looking for wasn’t there, rather than having to double-check a page’s URL after searching the page for the expected information.